Every iTestMic2 microphone is calibrated during production at our US facility for SPL level using a state-of-the art pressure-compensated Class 1 microphone calibrator. The Low and High range trim factors are stored in the microphone's non-volatile memory, and so when iTestMic2 is plugged into an iOS device running one of our apps, the calibration is automatically read and applied to calibrate the level and provide accurate SPL readings with no calibration required. All microphones deviate from flat frequency response, and to optimize the frequency readings from iTestMic2, we first test every unit to be within tight standards of frequency response, and then we go one more step. Using a Class 1 iPrecisionMic as the standard, we create an individual frequency compensation file for each microphone. The files are stored in the Amazon cloud by unique serial number, and can be installed in any Studio Six Digital app with a single button tap. To install the frequency calibration file, plug iTestMic2 into your iOS device running any of our apps, including AudioTools, and navigate to the Microphone Calibration page. Tap the "Get File" button, and the file is located using the unique serial number in iTestMic2, downloaded, and automatically applied. Once downloaded, the file will then be applied each time the iTestMic2 is plugged in. The frequency calibration files are stored permanently on our servers hosted by Amazon, and will be available to download anytime you install our apps on a new iOS device. This is a typical curve, after the frequency calibration file has been applied. 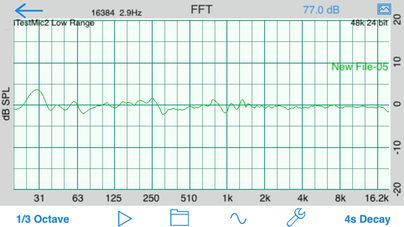 The LF bumps are artifacts from the pink noise cycling.